Home/People and Sound/National Defense/How is sound used to monitor and defend harbors? Harbors are complex environments with vessels delivering cargo, piers and pylons at which ships dock, swimmers, divers, and pleasure craft. To maintain safe and secure harbors, surveillance is needed to detect, classify, and monitor all local activities. Harbor monitoring technologies include in-air systems, such as radar, and underwater surveillance systems to detect divers, swimmers, underwater vehicles, and other potential threats. The most effective means of monitoring and defending harbors from underwater threats is active sonars. Sound signals are sent from a projector and the returning echoes provide information about objects in the vicinity. There are two general types of systems used in harbor surveillance: single projectors and networked arrays of projectors. Single projector systems include one transmitter that sends and receives sonar signals. The projector is typically situated to ensonify critical areas of the harbor. For example, the projector may be positioned to monitor a limited area or chokepoint, such as the entrance to a habor, as a first-point of detection rather than scanning an entire harbor. Networked arrays include multiple units connected to a control station. This allows for coverage of entire harbors. The U.S. Navy Marine Mammal Program uses bottlenose dolphins to perform tasks such as ship and harbor protection, mine detection and clearance, and equipment recovery. Bottlenose dolphins use echolocation to detect and defend against intruders. They have been used in both the Vietnam War and the Persian Gulf to protect naval vessels. The dolphins patrol the area using their sonar and alert armed trainer guards if they locate a swimmer. They are also trained to “tag” the swimmer with a marker so that the intruder can be located by Navy personnel. Passive acoustics are similarly used to detect, track, and classify underwater sources of sound based on the acoustic signatures of divers, boats, ships, underwater vehicles, and construction equipment. 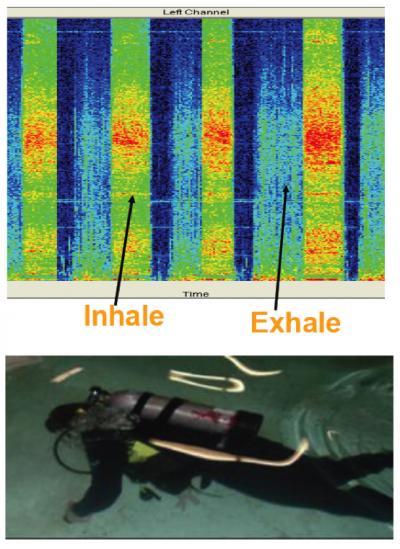 The Stevens Passive Acoustic Detection System has studied the acoustic signature of divers. Image provided by the Stevens Institute of Technology Maritime Security Center (http://www.stevens.edu/msc). CNN, Harnessing the military power of animal intelligence. Stevens Institute of Technology Maritime Security Center. PBS Frontline, The Story of Navy Dolphins. U.S. Navy Marine Mammal Program.